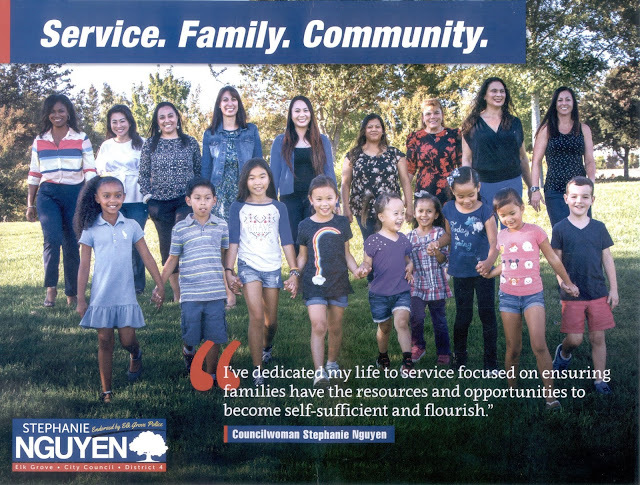 Whether it was good fortune, or well planned, Elk Grove City Council Member Stephanie Nguyen's first mailer arrived in local mailboxes as the same day as ballots. Appointed to the city council's District 4 seat in 2017 following the vacancy created by Steve Ly's election as mayor, Nguyen is running her first city council campaign. Nguyen is being challenged by fellow Democrat and current Cosumnes Community Services Director Orlando Fuentes. In her mailer, Nguyen, just the second female council member in the city's 18-year history, is squarely targeting her message to females and seemingly mothers. Among the diverse group of women in the photo are Elk Grove Unified School District trustee Bobbie Singh-Allen, Elk Grove Planning Commissioner MacKenzie Wieser, SMUD candidate Angela Spease, and Cosumnes Community Services District Director candidate Koi Rivers. The messaging also has a decidedly maternal tone with Nguyen saying "I have dedicated my life to service focused on ensuring families have the resources and opportunities to become self-sufficient and flourish." Not surprisingly, there are several young children pictured in the mailer. Nguyen's opponent, Fuentes, has not yet dropped a stand-alone mailer but has been included on one that features Elk Grove Mayor Steve Ly, Elk Grove City Council candidate Andres Ramos, and Cosumnes Community Services District Director candidates Rob Brewer and Jaclyn Moreno. If Nguyen succeeds in her bid, it will be the first time since 2008 a woman candidate was elected to the Elk Grove City Council. That year Sophia Scherman won her third four-year term.